The issue of private emails for public business has been controversial, occurring not only in Washington D.C. but in California, too, where a court held that only the portion of private emails relevant to official business must be disclosed as public records, not all e-mails sent through a public official’s private account. But federal law, unlike state law, requires that all federal officials’ records be preserved for posterity and accessible by historians, the media, and Congressional committees in perpetuity, with exceptions for sensitive classified materials. Yet Clinton’s aides reportedly took no action to have her e-mail communications preserved on government computer servers. That may violate the Federal Records Act, the New York Times reports. 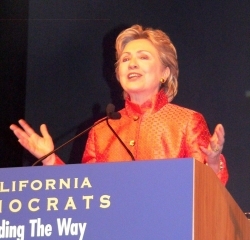 Clinton, the former First Lady, is also considered a frontrunner for the Democratic Presidential nomination. did not have a government email address at all during her four years as Secretary of State. A Clinton aide has insisted that she has complied with the “letter and spirit of the rules.” Her staff has pored through voluminous emails and turned over 55,000 pages of them after the State Department requested them. Hundreds of pages on the Benghazi controversy have been released. But other documents were withheld by her staff . Some government officials, including former Secretary of State Colin Powell, have used personal e-mails for certain communications. But Clinton’s successor, Secretary of State John Kerry, keeps all of his e-mail records stored on an official government server. So does President Obama, who emails only from a secure government account. It’s not illegal for a federal official to conduct government business through a private email account, however copies of all official emails should be sent to an official account to become part of the permanent federal archive. That was not done with Clinton’s emails and it is unclear whether some may have been destroyed or lost. For the future, a new bill signed into law by President Barack Obama in November requires that all official messages sent via a personal e-mail account must be copied or forwarded to an official account within 20 days. The new law requires disciplinary action for failing to archive records, but it does not apply retroactively. As Politico points out, the failure of Clinton’s staff to make her e-mails part of the official State Department records until recently, and then only with a portion of her correspondence, means that some of these records may not have been turned over in response to Freedom of Information Act requests, subpoenas or other document searches. Whether or not these actions are found to violate the Federal Records Act for preserving documents, the law that was in place during Clinton’s tenure lacked enforcement teeth. But the lack of transparency will likely be an issue raised by Clinton’s opponents on the upcoming presidential campaign trail.